There were several false starts to this list, which I originally wrote for the journal of the Children's Book Council, USA. I began writing it in a hotel in Vancouver. I did a little more in a hotel in Washington D.C. A bit more got done during the long flight home to Sydney. Then I junked what I'd written, because I didn't like how it was coming out. The problems were many. First of all, I couldn't possibly fit in all the significant books and authors of my childhood. The first dredging of the deep sludge of my mind made it clear I was also unable to organise the books in any meaningful way. All the books I wanted to mention I remembered because they were great books. All were and are important to me in many different ways and for many different reasons. I couldn't order them chronologically from when I read them because I mostly couldn't remember when I did. Most of them I read in that space of true discovery, from the age of nine or so to maybe seventeen or eighteen. I didn't think there was much point to ordering them by publication date either. They were new when I discovered them, regardless of whether they had been discovered by other readers days, months, years or even decades before. Ultimately, I was left with one of the simplest organisational methods of all for this piece. A cunning structure, beloved of librarian, booksellers and highly-motivated book owners. Alphabetical by author. So this is my own personal reading alphabet, the highlights of the years when I read six or seven or a dozen books a week. An annotated alphabet, with my comments and some rough notes as to what kind of books they are. I focused on Science Fiction and Fantasy, but others crept in. Many others had to be left out, for reasons of alphabetical, spatial or mental failure. I'm sure there will be many old friends of yours here, dear reader, but I hope there will some new (and old) discoveries as well. 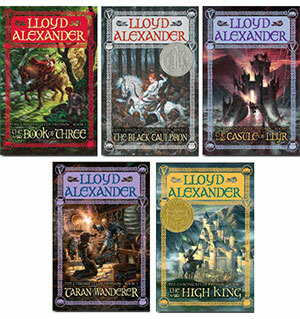 I remember reading Lloyd Alexander's Chronicles of Prydain completely out of order, but it didn't matter. I loved the combination of humour and adventure, and as I got older, my favourite book in the series changed from one to another and back again. I suspect this is because the careful mix of the serious and the light-hearted is different in each book, so they appeal to different moods and times. Taran Wanderer probably retains pole position to this day, but I love all the books. Joan Aiken's short stories are wonderfully imaginative and inventive as are her novels. My particular favourites are her short story collections, such as All You Ever Wanted and the 'unhistorical' novels set in a 19th century that never happened, from The Wolves of Willoughby Chase and Black Hearts in Battersea to The Cuckoo Tree. The later sequels (read with childhood long behind) never quite connected so well with me. Midnight Is A Place, the tale of two orphans forced to live by their wits in a horrendous 19th century industrial town, is another one I come back to re-read every now and again. Poul Anderson was one of my 'must-read' SF writers as a teenager. I particularly devoured his Dominic Flandry books, tales of a naval intelligence officer in a decaying galactic empire, fighting the good fight while also cynically looking after himself. The books became more complex over time, as did Flandry himself. A Knight of Ghosts and Shadows is the standout, but all of them are good. Start with the first, Agent of the Terran Empire. John Brunner's Traveller in Black had a major impact upon me. I loved everything about it, from the bizarre, elemental characters of a chaotic, magical past to the dreadful fates of many of the selfish people who unwisely wished for something when the Traveller was nearby. Brunner plays with ideas of fate, self-will, time, creation and much else with baroque mastery. Barbara Ninde Byfield's book The Glass Harmonica (reissued a few years ago as The Book of Weird) is paradoxically not a book remembered from my childhood. It is a book I wanted desperately to get after I read a reference to it in The Book of Andre Norton. If memory serves me correctly, Norton referred to it as the book you need to have to find out what a 'castellan' is and the difference between a wizard and sorceror. But I didn't get my hands on a copy until many years later, only to discover that it was worth the wait. Delightfully illustrated by the author, its subtitle hints at its contents: 'A Lexicon of the Fantastical, in which it is determined that: wizards see best with their eyes closed; Torturers reek of mutton, cold sweat and rust; It is Unwise to take a Herald on a Picnic ...' and much more. If only I'd got hold of a copy when I was 10, instead of 36! In minor tribute, I named one of the four main characters in my book Shade's Children Ninde. I am sure The Dark Is Rising sequence by Susan Cooper needs no further introduction here. I read The Dark is Rising first. I didn't know Over Sea, Under Stone existed and had to wait for the others since I got to the series early on. On cold, wintry days I used to imagine that I was about to slip into that other, magical world concurrent with our own, the one inhabited by the Light and the Dark and the Old Ones. Red Moon, Black Mountain by Joy Chant is what I would call 'harder-edged Narnia'. This is a novel in which children are transported to a fantasy world and take part in a great struggle against evil. Grittier and tougher than Narnia, it was unjustly neglected, probably because it was way ahead of its time. There is a sequel of sorts, but I never took to it. The Three Musketeers is not SF or Fantasy, but it has much in common with them. History, after all, is another world to which we cannot travel except in the mind. This is a great adventure story, a great love story, and a great portal to what is, in effect, another world. Be sure to find a good translation, one that captures the humour and energy of the original (from memory the Bantam Classics paperback is a good one). And be sure to watch the best films made from the book, The Three Musketeers and The Four Musketeers, directed by Richard Lester and adapted by George MacDonald Fraser. Where do you go after reading all the way through E. Nesbit? This was a particularly good question in the early 1970s when there wasn't an awful lot of fantasy around. Eager was Nesbit's natural successor and, to an Australian, his American children and settings were of interest in themselves, even apart from the fantasy elements. Knight's Castle is still my favourite. I bought them all again recently, in their clean white newness, as reissued by Harcourt/Odyssey with lovely Quentin Blake covers (but also thankfully with the original N. M. Bodecker internal illustrations). I'm a sucker for Napoleonic nautical adventures, and C. S. Forester started it all with his Hornblower books. They're more accessible than Patrick O'Brian of Master and Commander film fame (though I very much like his books too). Again, these are historical novels that have much of the same appeal as fantasy. Adventures in another time and place. Hornblower is a strangely likeable unlikeable character with much more to him than you might expect, and there are many personal, human stories in addition to running out the guns, climbing to the topmast, hoisting all sail and so forth. Nicholas Stuart Gray wrote charming, clever English children's fantasies, sometimes drawing on fairy tales like Rapunzel as he does in The Stone Cage, where the story is observed from the point of view of the witch's cat. I'm also very fond of Grimbold's Other World and The Apple Stone. Some of his books are rather too dated now, and self-conscious, but the good ones have not aged. Like other authors on this list, Alan Garner probably needs no introduction. Suffice to say that if I could write three pages that were as good as the last three pages of The Owl Service I would be a very happy author. Like many, I love Garner's earlier work more than the later books, though I always admire what he does. My favourites are The Weirdstone of Brisingamen, its sequel The Moon of Gomrath, and The Owl Service. When I was nineteen, and travelling around the UK in my beat-up Austin, I went to Cheshire and climbed Alderley Edge. But I couldn't find Fundindelve . . .
Robert Graves was important to me for three very different books. I, Claudius and Claudius the God seemed to me not to be novels so much as actual accounts given by the real Claudius. As I was fascinated by Roman history (particularly Roman Britain, thanks to Rosemary Sutcliff) I was deeply interested in an actual Emperor's real story – or so I assumed at the age of twelve or thirteen. The third book was Goodbye To All That, Graves's autobiographical account of his experiences in World War One. One of my great-great-uncles died in that war, at Flers. My mother's father, a young subaltern in 1916, died in the 1960s from emphysema that was a result of being gassed. Every little town in Australia has a memorial to the dead, a whole generation of young men lost from a country with only a tiny population. Graves really brought the First World War into sharp, personal focus for me for the first time. I believe there are two versions of the book, and one is considerably more complete than the other. I loved in my later teens. I can still re-read all the titles I've mentioned, which illustrates my high esteem for the books both then and now. I came to Georgette Heyer in my late teens. I don't like her murder mysteries and her 'serious' historical novels like Lord John don't interest me either. But I love her Regency Romances. Some are better than others, but the best are enormously entertaining, historically accurate, and very funny adventure stories. Oh, and there'll be some romance in there somewhere. I heartily recommend Friday's Child, Uncommon Ajax, Sylvester, These Old Shades, Devil's Cub, The Toll Gate and . . . in fact any of her Regency novels are well worth reading. I couldn't think of any authors whose surnames begin with I. Naturally a dozen of them will fall off my shelves as soon as I stop looking, and I will be e-mailed hundreds more names. Regardless, at this point, 'I' is for Incomplete, as in The Incomplete Enchanter by L. Sprague De Camp and Fletcher Pratt. Either of these authors could have appeared here on their own, De Camp for Lest Darkness Fall (modern engineer falls back in time to the late Roman period) and Pratt for The Blue Star (a fantasy set in a kind of 18th century pre-revolutionary France). Both authors were way ahead of the fantasy pack, beginning their work in the 1940s. Moomintrolls! I still want to live in a Moomin House on an island somewhere. These books are for any age, but I loved them most ferociously from the age of eight or so to ten or thereabouts (I've never stopped loving them, of course; now I just spread my affections among more books). My mother made puppets of the entire cast of Moominland Midwinter and put the book on as a puppet play when I was eight. Sadly, only the Groke survives, as no silverfish or mouse would dare eat that cold personage. For no other reason than the fact that it was the first one I read myself, I suggest starting with Moominsummer Madness, or perhaps Comet in Moominland. Chronology is not really important to the Moomin books, though the later ones are tinged with melancholy, perhaps from the long Northern nights. Captains Courageous introduced me to Kipling. A great sea adventure and a sharp insight into the relationships between boys, between sons and fathers, and between husbands and wives. It was contemporary when Kipling wrote it, so I'm not sure if can be called a historical novel, though now of course it is. For other Kipling, my favourites are (of course) Kim and the Just So Stories. And I liked The Jungle Book as a child, before every shred of its narrative power was used and re-used and turned to dust by Disney. A Wizard of Earthsea was a fantasy that, like The Lord of the Rings, seemed to me to be a true tale from somewhere else. Not a made-up story, but something real. I read and re-read it, and wished I knew the true names of the world around me. I felt the same with the two sequels The Tombs of Atuan and The Farthest Shore (the later sequels came out when I was in my twenties and thirties). I also found this sense of truth or reality in Le Guin's science fiction, particularly The Left Hand of Darkness and The Dispossessed. The Midnight Folk and The Box of Delights by John Masefield (the English poet) are two little-known fantasies. They are full of invention, connection to myth, legend and folklore, and fascinating characters. They have their faults, mainly (I think) because of some assumptions about how children's books were supposed to be written in the 1920s. But they are still excellent fantasy novels of normal children slipping into marvellous realms that co-exist with our own world. Be sure to get unabridged versions. Arthur Mee was probably a horribly well-meaning Christian gentleman who lived and breathed children's education. Nevertheless, his Children's Encyclopaedia, of which there were many editions over the years, was a vital source of much of my abstruse knowledge and peculiar trivia. I think I learned all my Greek legends at an early age from an old set of Arthur Mee's Encyclopaedia that had belonged to my grandmother. Where else could you look up the number of groats to a penny, or the heart rate of a stoat? Andre Norton ran neck-and-neck with Heinlein as my favourite SF author in my childhood. Interestingly, while I can re-read Heinlein, many of the Norton novels do not fare so well. though she was a great storyteller, her prose has dated more. But the good stuff is still good stuff, and in that category I would include Sargasso of Space, Plague Ship, Postmarked the Stars, Star Man's Son, Star Guard, Android at Arms, Beastmaster, Catseye and Star Gate. E. Nesbit was for an early part of my reading experience the only fantasy author available apart from Tolkien and C.S. Lewis. Some of her books were read to me by my parents and others I read when I was only six or seven. I recently re-read The Enchanted Castle and thoroughly enjoyed it, so I'm going to dig out The Phoenix and the Carpet, Five Children and It and some of the others. Slave to the word count, we shall skip to the next letter. Otherwise I would have something to say about the poems of Wilfrid Owen here. To be honest I haven't re-read Tom's Midnight Garden since I was nine or ten and I can't remember much about it, other than that I really liked it at the time. This points up the fact that I do reread my favourite books, usually once every five to ten years. It only works with really good books, but with them you can always get something new, in addition to the comfortable nostalgia of reading old favourites. I haven't re-read Tom's Midnight Garden because I don't have a copy, a situation that I will soon rectify. Q is really quite a difficult letter to find an author for. I shall have to embark upon a Quest to find one that I actually read when I was younger. Swallows and Amazons Forever! I think that Swallows and Amazons and its sequels can be classified almost as fantasy, in that they are children's adventure stories that couldn't happen now and probably couldn't have happened even in the 1920s and 30s when they were written. But then again, they are completely believable and, as a child, I so wanted to be in one of them. Preferably as a Swallow, not an Amazon. My all-time favourite is Winter Holiday. If Lake Windermere (one of the real lakes in the North-West of England on which the books' composite lake is based) ever freezes over again I shall be there. The Eagle of the Ninth introduced me to Roman history when I was nine or ten. It was a potent seed, growing into a stillspreading tree of many branches, because I'm still reading fiction and non-fiction about the Romans. The two sequels (though not direct ones), The Silver Branch and The Lantern Bearers, were great discoveries. I remember the excitement of finding out they existed and ordering them in to my local children's library. I like many other Sutcliff historical novels, but my absolute favourite is not one of the Roman novels, but a medieval one. It is Knight's Fee, the story of a Saxon dog-boy and his friendship with a young Norman destined to be a knight. I'm sure that everything that could be said about childhood infatuation with The Lord of The Rings has been said. It is enough for me to add that my mother was reading it when she was pregnant with me, dooming me to the life of a fantasy author. And to add that I love and respect Tolkien's work so much that while I may try and imitate some of the epic feel and sweep of his work, I trust I will have the courage to never steal his elves, dwarves, dark overlords and other coin to debase for my own foul purposes. James Thurber must be mentioned for The Thirteen Clocks. This is a deceptive book, for in addition to being hugely entertaining, it is written in kind of hybrid prose-verse style which I suspect many people may have attempted but been unable to bring off. The Golux and the Todal are tremendous inventions, but it is the language which I love most. ... which allows me to mention T. H. White's The Once and Future King, though I think the first part The Sword in The Stone is the best. Once again there are two versions, the stand-alone book is not the same as the text as included as part one of the entire sequence. My father's favourite science fiction and fantasy writer was naturally going to get a head start with me. Jack Vance's prose style is instantly recogniseable, as is his baroque and lustrous imagination, always coupled with a sly sense of humour and great erudition. My favourites are the five Demon Princes books, which despite the series name are science fiction novels: the Demon Princes are criminals on an interstellar scale. I also return often to the Planet of Adventure series. Of his fantasies, the later Lyonesse series are a personal favourite, though I think only the first one was published while I was still in my teens. Almost anything and everything by Vance is worth reading. It's also for P.G. Wodehouse (the Psmith and Uncle Fred novels are my favourites, not the Jeeves ones), and the historical fiction writer Ronald Welch, who would run second to Sutcliff as my childhood favourite in this genre. But space is of the essence, so I will mention The Winter of Enchantment by Victoria Walker. A charming forgotten fantasy from the late 1960s, the story of a young boy in the 19th century who must take on a great Enchanter to help a girl rescue herself from his clutches. Lots of people are interested in republishing this work, but the author has proved difficult to find, possibly by choice. It's a pity, because the book should have another run out on the bookshop shelves. X is for the reader participation segment of this article. If you can think of a writer whose surname starts with 'X' that I might have read in the years roughly between 1970 (when I was seven) and 1983 (when I turned twenty) let me know. ... whose books I didn't read when I was a child (because they weren't yet written), but wish I had. Not just because his name starts with 'Z'. The first Amber series, beginning with Nine Princes in Amber were important reading for me as a teenager. I really, really liked the idea of a central world that cast shadows of itself, our Earth being but one of those shadows. I also liked that Zelazny didn't explain stuff. There was a lot of action and the story kept moving and you had to keep up, only after reading and re-reading the whole series did I begin to understand what it was all about. The story was everything and it was all there, only you might not get it the first time through. Now you know my ABC of books remembered. Or at least one version of it, for there are many authors left out, and many more books that I could have remembered, should have remembered, would have remembered . . .